On 23 June, Britons will decide whether they think their country is better in or out of the European Union. While the debate over a potential Brexit is raging within the United Kingdom, it has also raised questions in other European countries about their own relationship with the EU. According to new research, euroscepticism is on the rise in Europe, but most Europeans want to see the UK remain in the EU. A study conducted by the Pew Research Center shows that nearly half of Europeans surveyed (47%) had an unfavourable view of the EU. However, 70% said that Britain leaving would be a bad thing for the union. 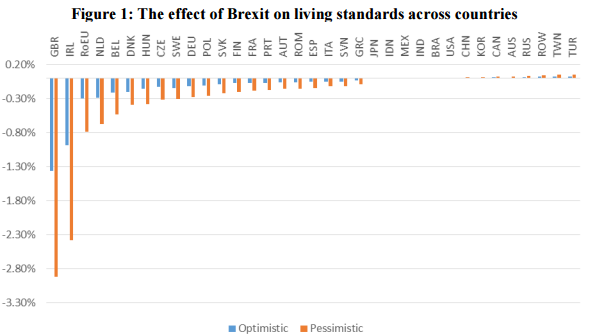 This is in line with research conducted by the Centre for Economic Performance, which suggested that all EU members would be worse off if Britain left the EU. 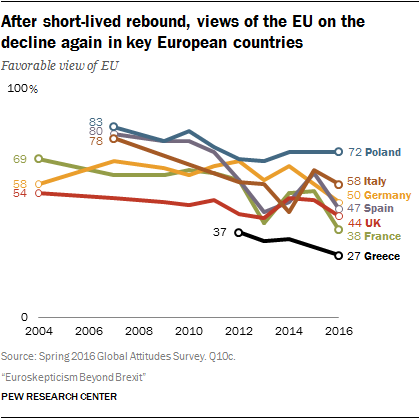 The Pew research also shows that Europeans view the EU less favourably than they did in 2004. 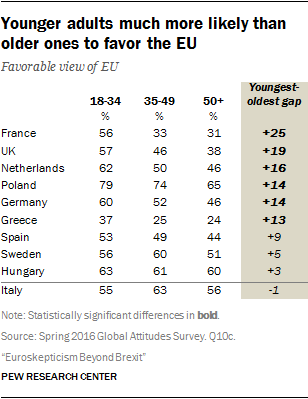 In general, young people across Europe – aged 18 to 34 – view the EU more positively than people aged 50 and over. Researchers found that much of the dissatisfaction felt by Europeans has been caused by the EU's handling of the economy and also the ongoing refugee crisis. In every country surveyed, overwhelming majorities were unhappy with how Brussels is dealing with the refugee crisis. Meanwhile, dissatisfaction with the EU’s handing of the economy is also high. About 92% of Greeks dislike the way the EU deals with its economic problems, while nearly half of Germans also disapproved. If Britain votes to leave, European dissatisfaction with the EU’s handling of the economy is likely to get worse. The Organization for Economic Cooperation and Development (OECD) argues that if Brexit happened, the GDP of the EU would fall 1% overall by 2020. Generally, there is an overwhelming sentiment across Europe that Brexit would be a bad thing for the European institution. France is the only country where more than a quarter (32%) of the public say it would be good for the EU if the UK departed. In four out of the nine countries surveyed, over 70% of people agreed that Brexit would hurt the EU. Have you read? Britain's EU referendum: what you need to know What would Brexit mean for the UK economy? Who pays the most tax in the EU?